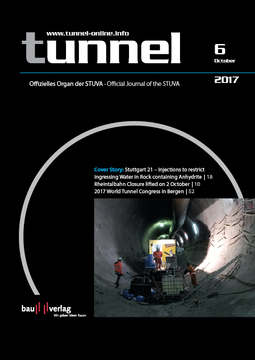 The 9.5 km long Filder Tunnel connects Stuttgart Central Station, lying in a valley basin, with the Filder plateau located some 155 m higher. 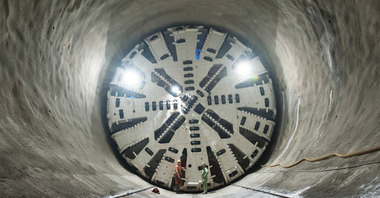 The four sections of its two tunnel tubes are being driven one after the other by means of a Multi-Mode tunnel boring machine (TBM) with 10.82 m shield diameter – the lower portion of the tunnel over roughly 3.6 km and the upper one over a length of approx. 4 km. The TBM is not applied in the 1162 m long geological transition zone (roughly in the middle of the tunnel) consisting of unleached gypsum keuper. 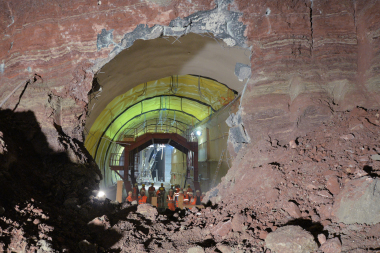 On July 4, 2017, the TBM reached the geological transition zone in the upper portion of the west tube, thus successfully completing its second shield passage. 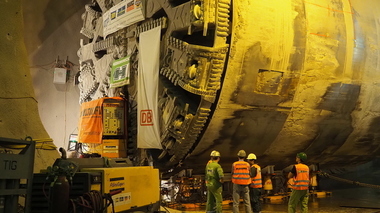 In order to accomplish its third passage, the TBM moves through the transition zone tackled by conventional means and is turned round underground in the cavern foreseen for this purpose in front of Stuttgart Central Station prior to embarking on the final section of the Filder Tunnel as from autumn 2017.